This page is also a description of various short walkways/trails to the base of Lower Yosemite Fall. 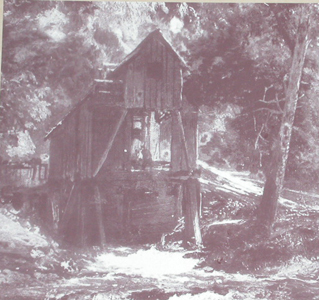 Naturalist John Muir, who “was largely responsible for the establishment of Sequoia and Yosemite National Parks,” built a cabin (wooden shack attached to a sawmill) along the course of Yosemite Creek just below lower Yosemite Fall in Yosemite Valley in 1869 and lived in for two years. In 1903 he camped for three nights in Yosemite with president Theodore Roosevelt and spent much that time shaping the president’s conservationist attitudes. 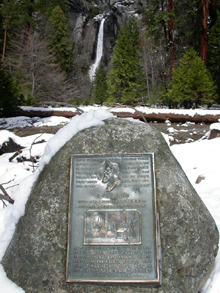 In 1924 a plaque was mounted on a rock at the site of the cabin. To find the site of the sawmill and cabin, ride the Yosemite Valley free shuttle bus and get off at stop number six, lower Yosemite Falls . If you are riding your bike, either plan to walk your bike, or bring a lock, as no bikes are allowed on these trails, yes, even early in the morning when you think no one else is around. At the bus stop, near the bus stop (second map below) and and at the restrooms a bit up a path to your to your left, (first map below) you will find a map of the loop trail, or actually more a path/walkway, to the base of lower Yosemite Fall. In both maps, the river is in blue, loop trail is in brown, the bridges over the river are in tan, the main road at the bottom of this picture of the map is in gray. Shuttle bus stop #6 is in the lower right hand corner of both maps above. Cross a bridge to a spur trail section off the main loop. There you will find the plaque, and a bench to sit on and enjoy relatively the same view John Muir had. From the far west pathway (or from the lodge) along this loop trail, the view of Yosemite Falls (lower, middle and upper, in full flow in February 2017). A larger copy of this photo is at the bottom of this page along with one from June. A quick walk you should not miss is in the vicinity. Return to shuttle bus stop number six. Looking across the road you can see a path leading to a bridge over the river. When you first step up on to the bridge, on the left hand side, there is a metal sculpture showing the depths of the water various years Yosemite Valley has flooded. It is amazing to stand on the bridge and see when Yosemite valley became a lake. Yes, the entire bridge has been under water at times. 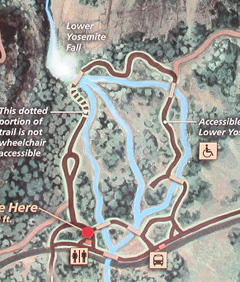 The trailhead (starting point) for the hike to the top of Yosemite Falls is not in this area. Read Upper Yosemite Fall hike for more info. Muir was not the only resident of this area. Archeological work in the Lower Yosemite Fall area proves American Indian use of this part of Yosemite Valley for the last 5,450 years in two large village sites. Indians chose to live on this side of Yosemite Valley because it gets more sun in the winter. Some visitors in the winter will be surprised to find no snow here, or even anywhere in the valley. 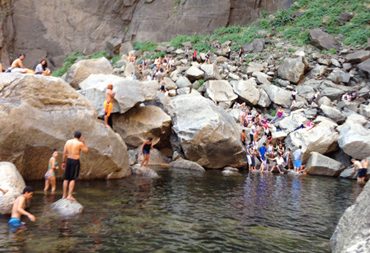 Late summer visitors can be dismayed to find no water in Yosemite Falls. 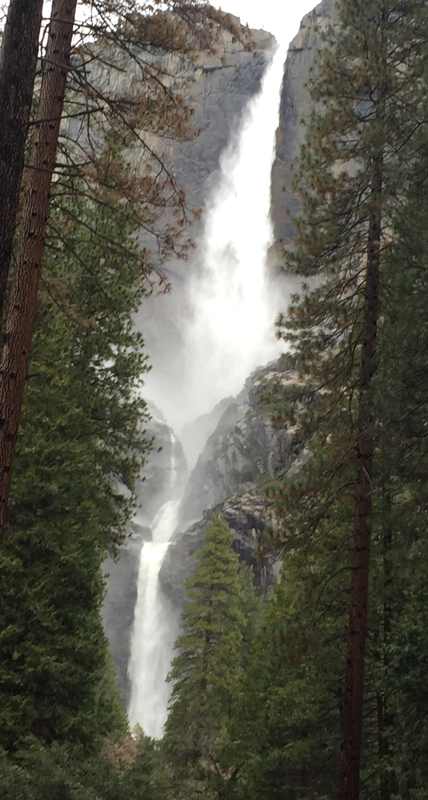 Four Accidents in four days at Lower Yosemite Fall. 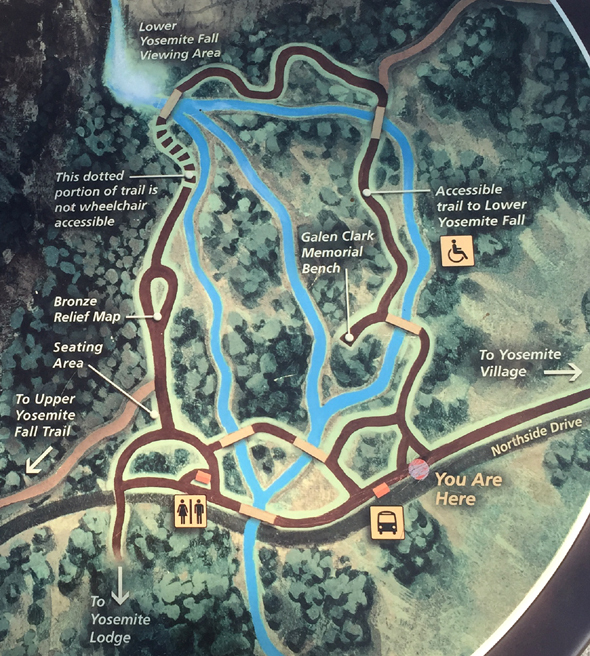 “Last week in Yosemite Valley, on four consecutive days, the Yosemite Emergency Communications Center (ECC) received 911 calls for visitors who had fallen and were injured while venturing off trail near the Lower Yosemite Fall Footbridge. The first incident happened on Sunday, August 3: a 45-year-old male was upstream from the footbridge, standing on a rock, when his foot slipped out from under him and he slid down the face of the rock to the ground. As he slid, he struck his head on the rock, and was bleeding behind his left ear. On Monday, August 4, a 19-year-old female, while scrambling on a slick boulder at the base of Lower Yosemite Fall, slipped and took a five-foot sliding fall off the boulder; unable to walk, the subject was extricated by a Yosemite Search and Rescue (YOSAR) carryout team. She suffered a trimalleolar fracture (an ankle fractured in three places), requiring surgical repair and will have an extensive period of recovery. On Tuesday, August 5, a 14-year-old female lost her grip while scrambling on a boulder, slid headfirst down the rock, and injured her left wrist while trying to slow her fall. Although, at the scene of the accident, the subject was nearly certain she had fractured her wrist, no fracture was noted on the x-ray, and she was diagnosed with a severe sprain. 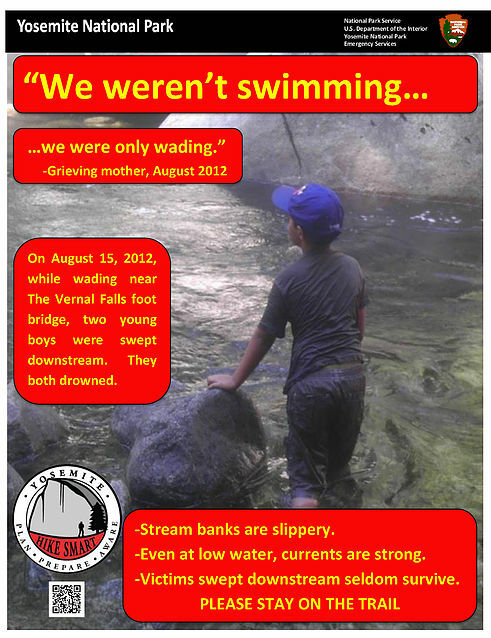 Finally, on Wednesday, August 5, a 45-year-old male slipped and fell while scrambling on uneven terrain not far upstream from the footbridge, spraining his ankle. After the above-mentioned accidents, yet another occurred on Sunday, August 10. A 26-year-old male was scrambling on the rocks between the footbridge and the base of the waterfall when he slipped and fell, sustaining a large scalp laceration which required repair at the Yosemite Medical Clinic. Additionally, earlier this summer, in June, there were two serious accidents in the same area, near the pool at the base of Lower Yosemite Fall. Although it is not illegal to scramble up to the pool, it is strongly discouraged due to the risk of injury and also for the risk to responders of these incidents. While you may see many people doing this during your visit, please remember how truly dangerous it can be and make smart choices.Even though it is tempting to leave the trail and scramble to the bases of Yosemite’s waterfalls, especially as water levels drop, the boulders at the base of waterfalls are always treacherous. Even when dry, the granite rocks remain surprisingly slick, having been polished smooth by the pounding, falling water most of the year. When rescuers respond to these accidents, even though they are wearing footwear with sticky rubber soles and are experienced in navigating through this type of terrain, they find themselves proceeding with extreme caution. PLEASE STAY ON THE TRAIL/BRIDGE.